Aubrey Zaruba: Sample Anyone ?!? I never used to be a big fan of dressing up or Halloween until I discovered how much fun it is to do a group costume. The past several years my friends and I have done group themed costumes. Each year the goal is to outdo the year before but still keep it simple, inexpensive, and funny. 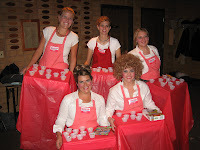 Most of the usual group is either married, out of town, or just Halloween scrooges this year so I pulled another group to together to try to top last year's oompa loompa costumes by being Costco sample ladies. We had tons of fun making the costumes and getting ready. 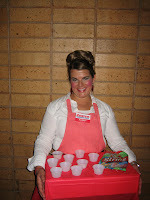 We showed up to the party in our costumes complete with big hair, makeup, and of course samples. I couldn't stop laughing at how funny we were. 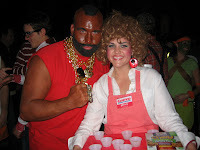 Our costumes were a big hit and we had lots of fun doing them. Any good ideas for next year? Awesome. I love it. Especially the hair. I think that needs to become your sunday hair do. That is a very fun idea! I'll don't know about any good ideas for next year but if I think of anything I will let you know. Nice! I knew what you were just from the pics. Fun! awesome idea! looks like so much fun! Hilarious! Such a creative idea. I'll start thinking o ideas for you for next year! Awesome blossom! What a creative costume idea. We missed you at our recipe exchange brunch... but I did email you my recipe! Hope things are going well! Cute costumes! 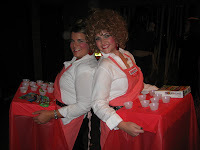 A couple actually dressed up as the same thing at the Halloween party we went to. I guess everyone loves the costco sample-givers! I love it! So clever and so cute! You can't beat those Costco Sample Ladies. Classic. I love the costco sample ladies ha ha they are so nice so im sure you would have been a very good sample lady. That is hilarious! You guys look awesome! I love keeping up with you and your live. I love it!!! Where did you get the name tags? Will you plan my costume for next year?